These colorful jute mats help you keep a positive affirmation in mind throughout your practice and after. 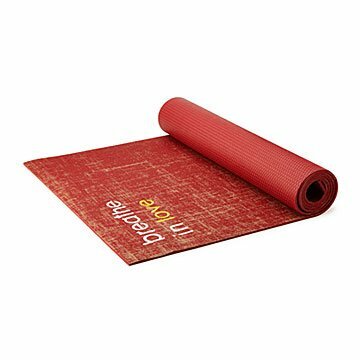 Keep your mind on the mantra and the mantra on your mind thanks to these yoga mats. The colorful, recyclable jute designs feature beautiful sayings, "breathe in love" and "I am free" in silk embroidery. Repeat the mantra throughout your practice and notice how it sticks with you even after you leave the studio. The eco-friendly mat isn't just a beautiful gift for yogi friends, it helps them stay centered and open to endless possibilities. Made in Los Angeles, California. Wash your mat down with a soft brush and a non-oil based soap or detergent, then rinse off. Repeat if necessary. Hang dry outside, in sun if possible. DO NOT PUT IN DRYER. Wash your hands with soap and water before practice to reduce oils on your hands. Do not use creams nor oils on your hands or feet before your practice. Always keep a towel near you to wipe away any perspiration.